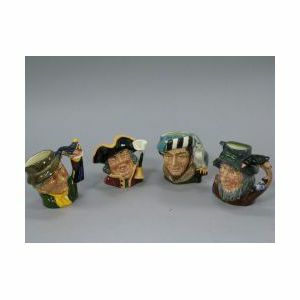 Four Royal Doulton Toby Jugs, Towne Crier, Punch & Judy Man, The Falconer and Rip Van Winkle. Wedgwood Dark Blue Jasper Teapot, Pipe and Square Lidded Box. 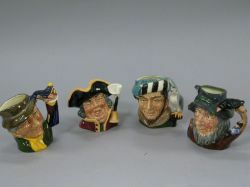 Four Wedgwood Dark Green and Primrose Jasper Items. Wedgwood Blackberry Majolica Milk Pitcher. Twenty-seven Wedgwood Assorted Transfer Decorated Plates. Five Wedgwood Lustre Decorated Ceramic Pitchers and Two Vases.